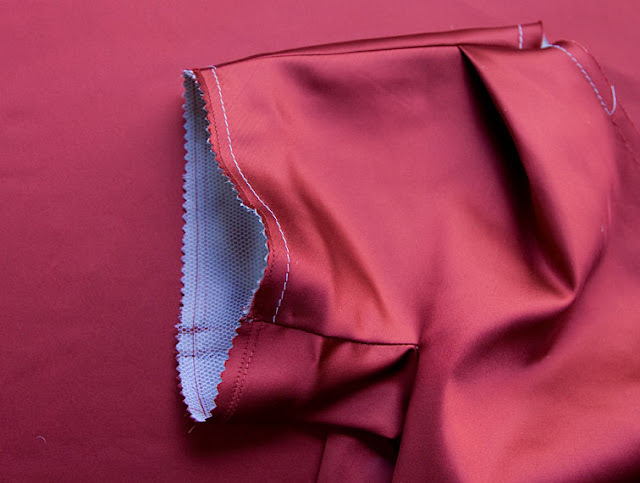 Maybe I’m thick, but it took several reads, many huh?’s, wtf’s, umms and errs, biting of nails and even reading slowly aloud to self, to finally click that Burda’s sewing instructions are basically saying “insert sleeve hem stiffening“! It all makes sense once you know, but isn’t it amazing how the gist of things can get lost in translation? 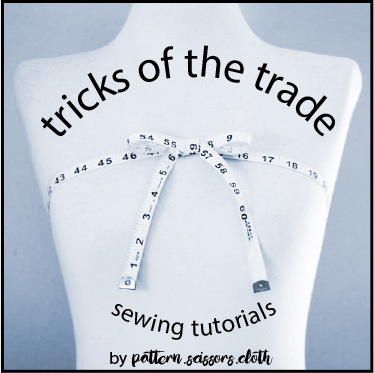 I have read quite a few comments in blogland about Burda’s confusing instructions, and I think I now know what you all mean! 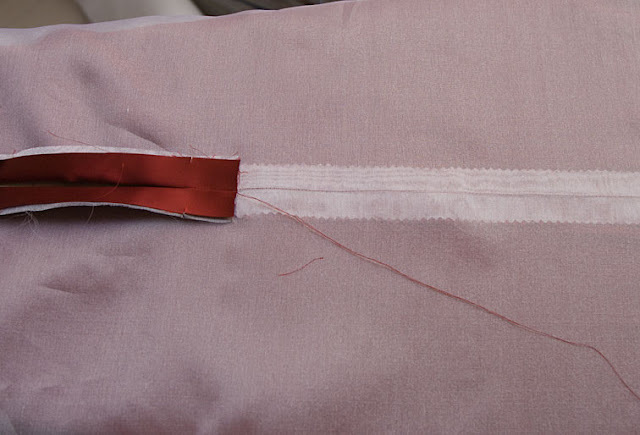 Neaten the hem edges if you are not lining the dress. I will line my dress, so I’m leaving the hem edges as is. 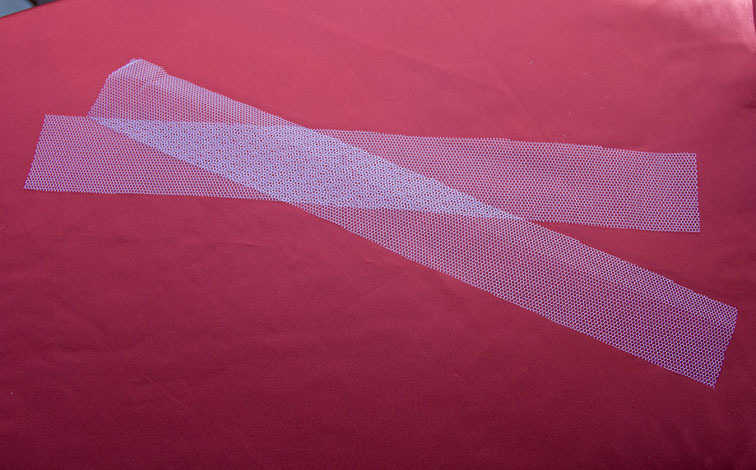 Attach the other edge of the net strip to the dress at the three seams, or in my case I am catchstitching the whole thing to the organza. This is the beauty of underlining – you can attach everything seamlessly inside! 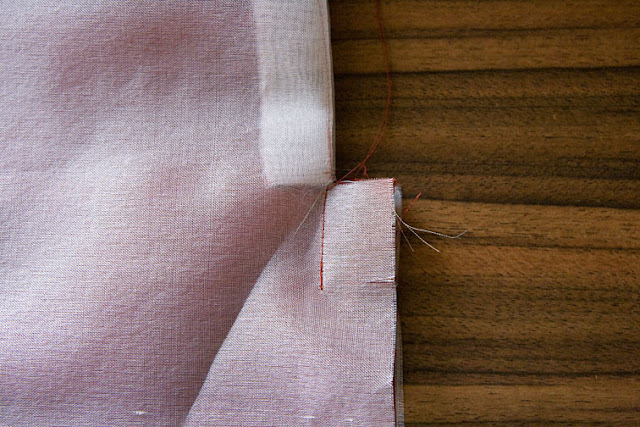 Now turn up the 3cm sleeve hem, folding it around the net, and sew your hem. 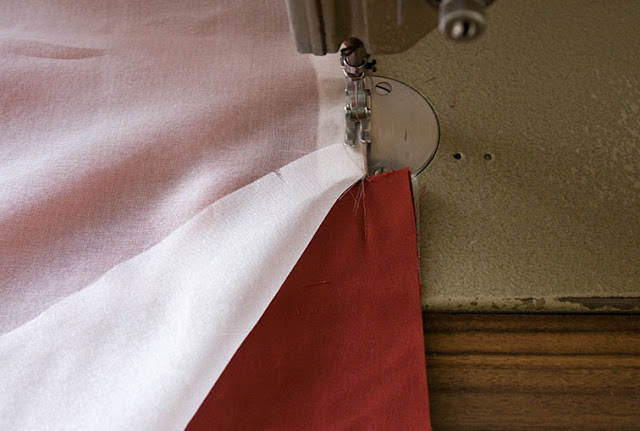 The idea is to have a smooth folded edge for the hem, so don’t press it flat! I blockfused my facings using a lightweight knit fusing. Because my main fabric is quite stretchy, I applied the fusing in the opposite direction to normal to minimise stretch, ie crossgrain of fusing to lengthwise grain of fabric. 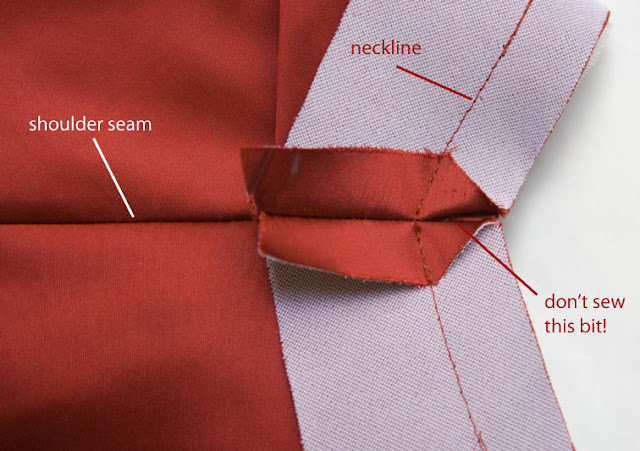 On necklines that have a sharp angle, this allows for a nicer turn at the neck edge without extra clipping. When you sew the facing to the bodice stitch exactly to this point and backtack. 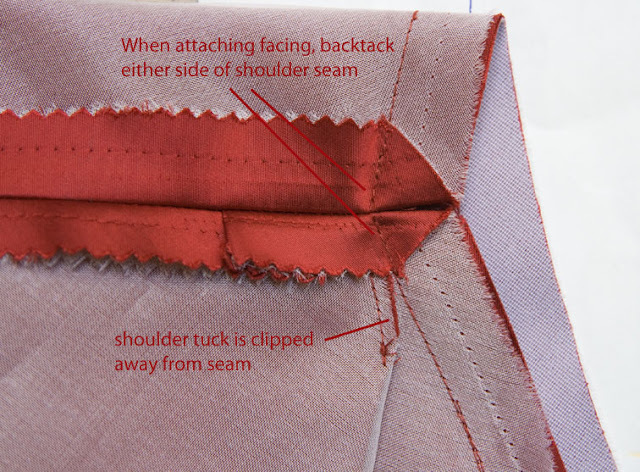 Continue stitching round the neckline stopping and starting again at the opposite shoulder seam. With this dress things get a bit chunky around the neck edge at this point, so to minimise bulk I trimmed the inner fold of the shoulder tuck so it didn’t extend into the neckline seam. 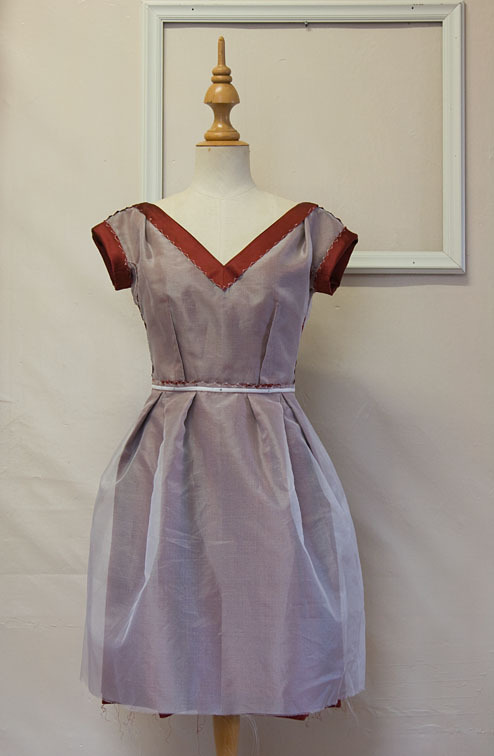 I understitched around the facing by machine – I actually wanted to do it by hand for this dress but I machined it out of habit! I suppose I could unpick it and redo it when I install the zip, which I also want to do by hand…..
At this stage I hadn’t even tried the dress on, and needed to check the fit properly before I attached the skirt. I sewed in a temporary invisible zip and it fitted really well – sorry no pics! 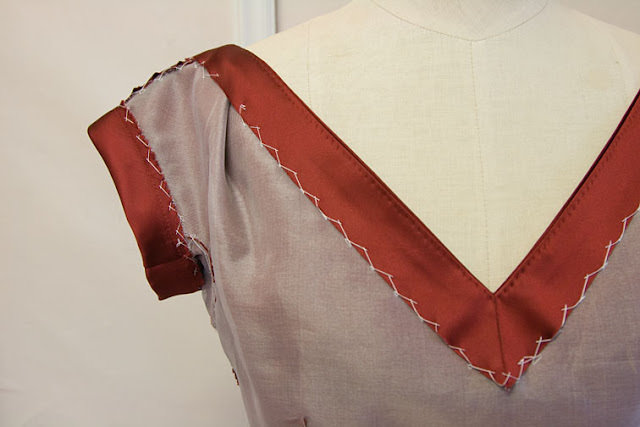 Usually I have to shorten the bodice because I am short-waisted but it looks like it is sitting correctly at the waist – so if you are normal-waisted you might have a length alteration to do! I underlined the skirt with silk organza too, but used a slightly different method to the bodice. 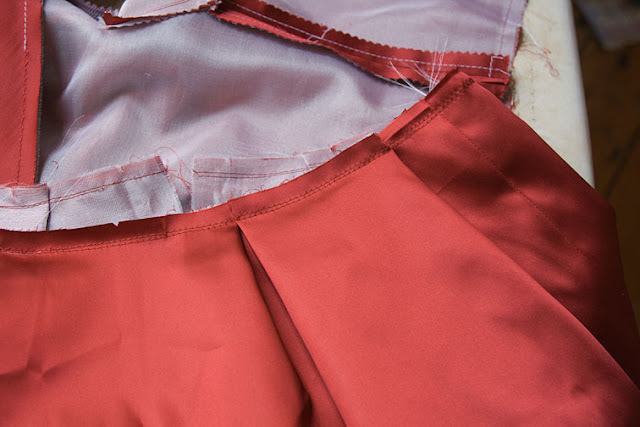 I first sewed the skirt panels together, then the organza panels together. 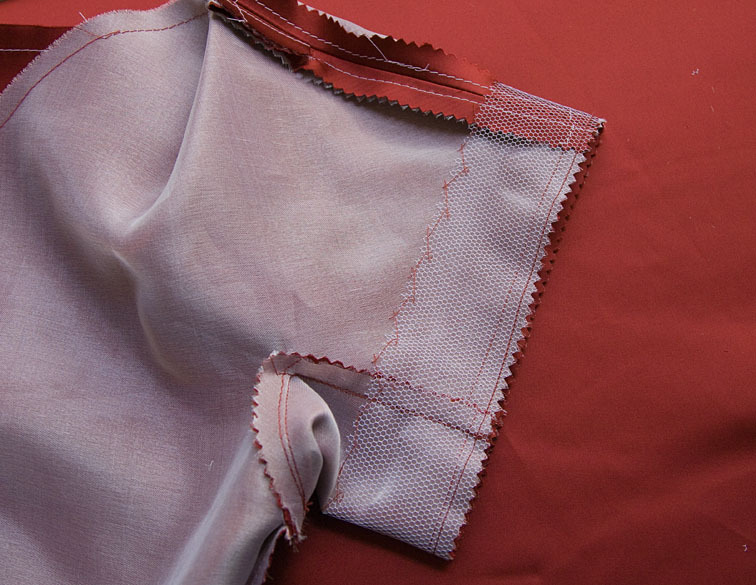 Then placing them wrong sides facing together I stitched the pleats in place through both layers – don’t they look luscious?! all ready to insert a zip – which is what I am going to do tomorrow! 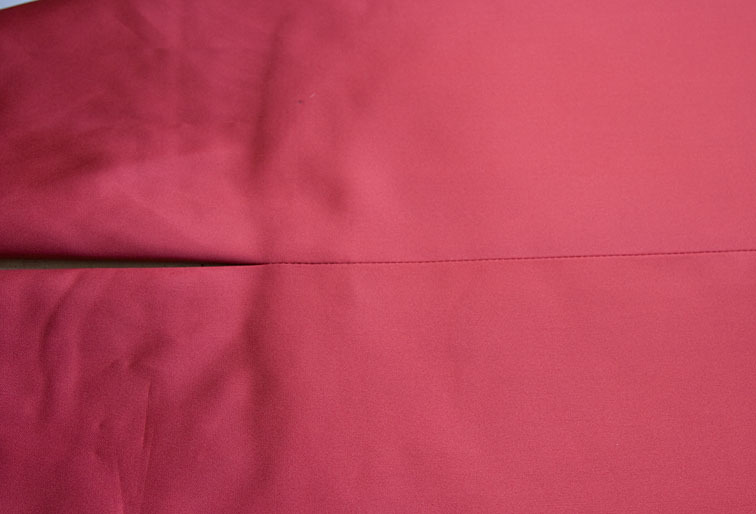 Just the lining, zip and hem to go now – hopefully we’ll have some pics of the outside soon! Oh wow – this is going to be an absolute stunner! Seu vestido é mais que uma roupa, é uma obra de arte. 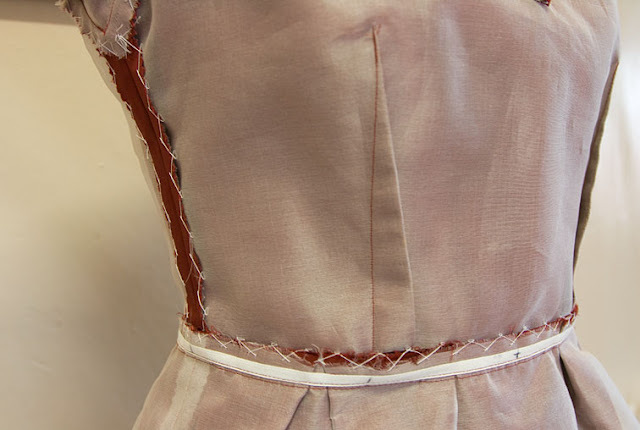 I have to say I'm drooling over the construction of this dress (I have no idea why I get so excited about things like catch-stitching seam allowances to underlining – surely any normal person would find that unimaginably dull?) Anyway, I think it's so lovely, you should wear it inside out, to show off your 'mad sewing skillz'! Oh, I'm really excited. 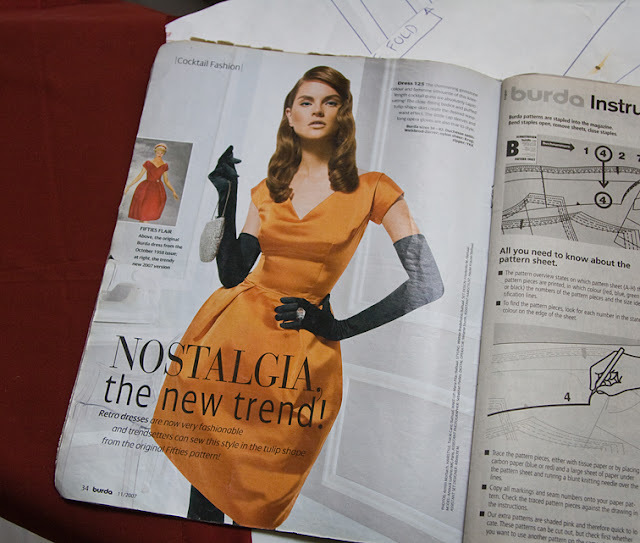 I've been thinking about making this dress for April but hadn't really seen a detailed iteration of it. Can't wait! I think your sewing skills are amazing. I would love to learn the skill of catch stitching like that!!! The dress is beautiful on the inside, can't wait to see the finished product!! I LOVE that I have to stare at your photos and reread your explanations in order to really get it. Not that you are unclear, just that you stretch me! thank you! What a fantastic challenge and an exquisite dress. This looks great! Can't wait to see your finished project. Do you think you can do a tutorial on lining the dress? Thank you! Oh wow, this looks amazing. I can't wait to see it on you. That satin (is it duchesse satin?) looks absolutely gorgeous and luxurious. Looking good! Just goes to prove that the insides have to look good for the outside to look beautiful. It will certainly be well worth all the work in the end. Can't wait to see the finished dress! This is FANTASTIC! Wow..the inside looks fantastic! I agree with Janice…a tutorial would be fab! Another enthusiastic process-watching fan here! Following this project is an education. I have one question – why (sorry, I always want to know why) did you attach the underlining differently on the skirt? I wondered if it would make the skirt hang a little more softly this way? Another – WOW. I love the dress – even inside out. Your explanations are incredible and so easy to understand. I've had the same problem with Burda – definitely translation issues. Can't wait to see the finished dress and you must wear it!!!! 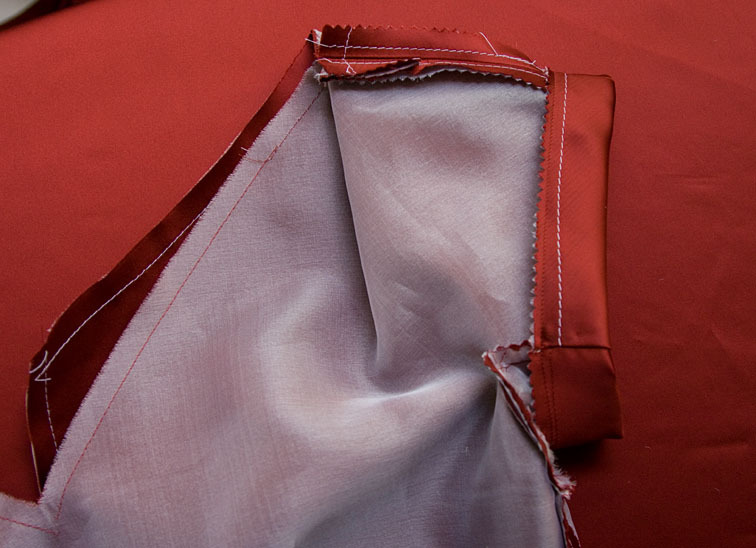 ~Tanit-Isis – I think rounded hems, rather than flat-pressed, are a couture thing. I have padded skirt hems on gowns to round them out, but not a sleeve before! I probably could have eliminated the net in this dress because the organza pads out the hem quite well, but it is fun to try new things! 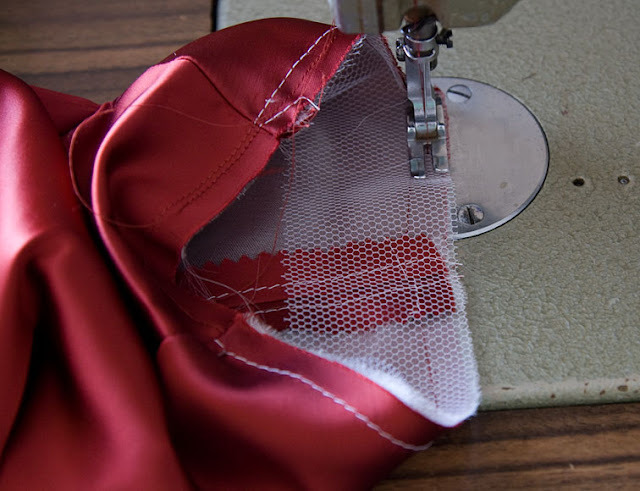 ~Janice and Debi – ok, I'll show you how I do the lining too! ~didyoumakethat – it looks like duchesse doesn't it! It is actually a polyester/elastane satin. 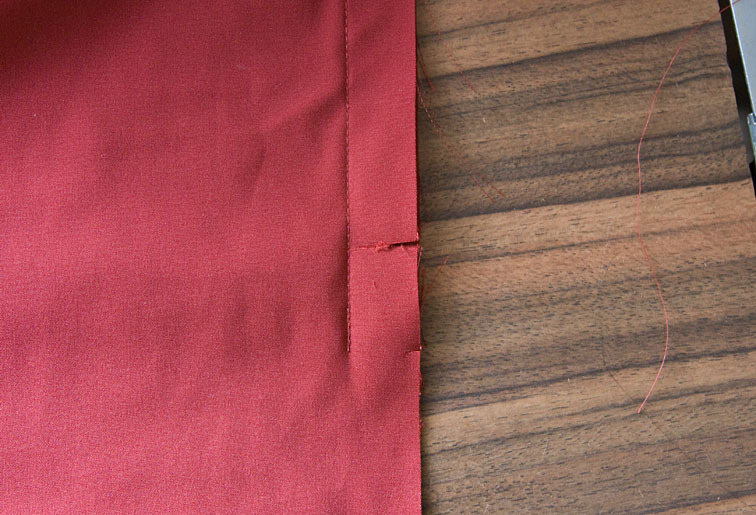 ~Judy – I did it this way so the seam allowances in the skirt are not exposed – when lined the skirt won't be fully enclosed like the bodice. I also think it is less bulky than hong kong seams. I always want to know why too! Wow! It looks beautiful even inside out without lining! I love watching your construction. I've never made anything so complicated. It's fascinating. And I like to think that I am learning something for the future too! This is coming along so well! Yes, to the Burda instructions. I've had a few head-scratching moments over the long-winded convoluted nature of their instructions, once you “get” it, it is fine, but it's the “getting” it that can be a challenge in the first place! This is beautiful work, I can't wait to see it finished! 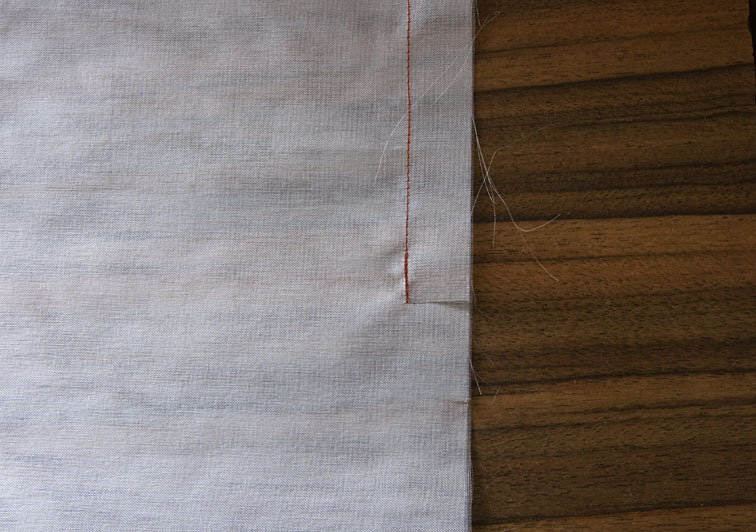 The one that always gets me with Burda is the way they describe understitching. The detailed description is far more confusing than a simple 'understitch the facjng' which you could at least Google if you didn't know how to do it. I do think the translations add a certain charm though. I wonder if German doesn't have versions of some of the same sewing terms as English and so Burda has to spell things out a bit more? Really enjoying seeing the construction of the dress! Wow! Your dress is going to look amazing Inside and out! I've just awarded your blog with Versatile Blog Award. Take a look at my blog for the award rules. Wow that catchstitching is just beautiful! I can't wait to see this dress from the outside! Sherry, I think I'm hopping across the ditch for a few lessons! I love your tutorials. I've had my eye on this pattern for while, but don't really have a need for it either. Your photographs and details are just amazing! It looks gorgeous! !